The renowned Dutch company de Architekten Cie., that won an international request for proposal and tender in 2012 for the development of a new satellite city in Russia, on the periphery of Moscow, has been chosen because of its large experience. The construction firm SU-155, which is leading the project, has been developing the masterplan with de Architekten Cie. in the past two years and the project is progressing on schedule. This means that the building process of Vlashika will probably start in 2014. Aside from commercial buildings, shops, restaurants, pharmacies, services and amenities, the mixed-use development of different buildings will consist of approximately 15,000 units or over 1 million square metres of residential area, ranging from single family detached villas to high density apartment blocks and social housing. 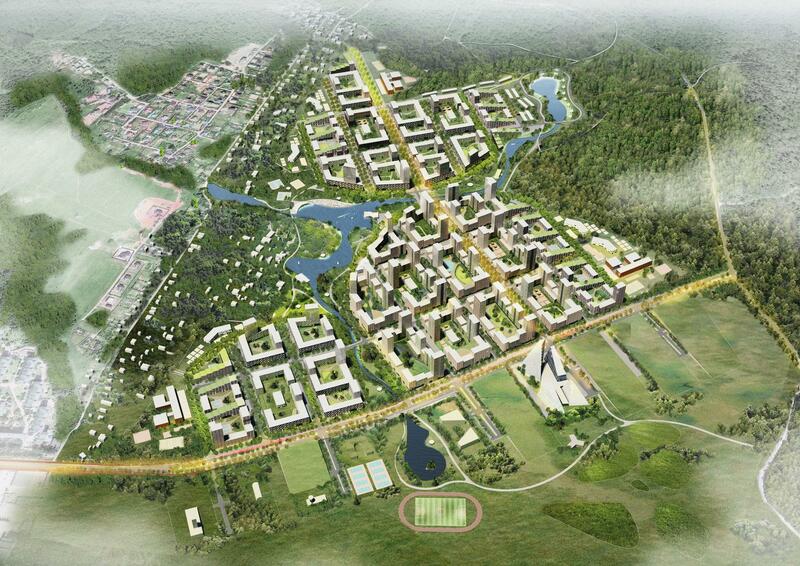 At the heart of the project there will be laid out a large landscape park, with a lake in the centre. The park functions as an ecological corridor for flora and fauna and it also serves critical sustainability functions, such as wildlife corridors through the new development which is in a greenfield condition, and it also is meant to be a biological filter, collecting and cleansing storm water runoff from the new buildings and recycling it for grey water functions and water-based recreational activities. Recently De Architekten Cie has also been selected for a competition to design an International Financial Centre in Moscow, as part of a consortium lead by KCAP architects & Planners from Rotterdam, the Netherlands. The Vlashika area, where eventually 50,000 people will be living, has been subdivided into three smaller neighbourhoods, while simultaneously improving the overall spatial quality of the plan. Around the edges of the park an area like Manhattan Central Park in New York will be created, then at the heart of the project there will be an area with a kind of London atmosphere, and the third area has the kind of terraces that one sees in Paris. The designers of De Architekten Cie. have been thinking quite long about the living environment, that needs to be sound, and this is the result. There will be a pronounced character, both for the areas and the public space. Two motorways will be running through the area, so there will be a good infrastructure and green areas with lakes. De Architekten Cie. continues to promote the courtyard block typology, as used in Amsterdam IJburg, Seoul, Korea and Perm (Russia), for its flexibility, density, size and almost limitless configurations. The courtyard block has frequently demonstrated its efficacy in promoting social cohesion and harmony. De Architecten Cie. is one of the most dynamic architectural, internationally operating companies, famous for its philosophy "We design by challenging. By asking the right questions." In the past few years, the company has been quite active in different countries, and is, amongst others, participating in tenders for projects in Turkey (Istanbul) and another project in Russia. The Dutch company aims to create sustainable environments for users and for the society and culture in which its designs are realised. Projects at the Architekten Cie. vary in scope, type and size: from individual houses to large-scale mixed-use projects. The company consistently focuses on adding value to every assignment or project. They regard architecture as a complex discipline that involves the community, clients and engineering technology. "Vlashika is more than architecture - It is the organisation of a city"
Croatian architect Pero Puljiz, feels quite content with the Vlashika project and emphasizes that for him and his team the development of the new satellite city is more than an architectural or designing process. More than a architect he operates as a urban developer, better still, an 'urban organizer', which he finds most fascinating and challenging. Pero Puljiz: "I think we can really add something to this project with our experience. A strong identity of the architecture in a new city like Vlashika, is of the utmost importance. Inspired by the rural environment, we have projected a lake in the middle of the area and subdivided the whole surface into three areas with different typologies of buildings. This project exploits a new type of urban pattern within the European context. Instead of having typical square blocks, with central courtyards, we have designed an octagonal pattern for the blocks and thus the courtyard will be mingled with the intersections. This, with the purpose to create an opportunity for more public spaces within the micro city. The project developer has chosen for 80 towers each with 25 floors." Pero Puljic: "It is a real challenge to build such a city from scratch. At the same time it is a big responsibility. The assigment was quite simple: we were asked to design blocks of houses on a surface of 1 million square metres. So we thought of building so-called dachas, or Russian villas, on a 10,000 square metres area, then medium-sized buildings on a surface of 200,000 square metres and that left us 750,000 suare metres for towers between 10 and 24 floors, with three appartments on each floor. That is the whole idea." "Architecture is a way of life"
Pero Puljiz is very much into city-building the last two years, although he still designs houses for private people. Nevertheless he feels that he has evolved from an architect, to an 'urban organizer'. Puljiz is concerned about the problems of the big cities of the world, like Moscow, Bejing, Bombay, Caracas, where the majority of the people live in poor houses, sometimes even in cardboard houses, on mountains and the rich people live in far better conditions. The poor people of the world's biggest cities most of the time don't have good sanitary facilities, for example. The problem is urgent and Puljiz feels involved with the problem, but he recognizes that an architect on his own is powerless. There are the governments and municipalities who make the decisions. Puljiz: "It has been interesting to be involved in city building during the last two years. The 21rst century will be the century of the cities. By 2050 75 % per cent of the world population will be living in the cities. This is a huge problem, because for the poor people there are no good facilities. There is a lot of air pollution, the infrastructure is bad and so on. In some areas there are not even doctors and there is no police. So the big cities of the world have a huge problem." 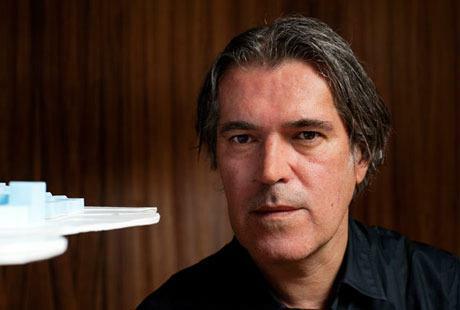 Pero Puljiz won the tender for the Hotel Sun Garden in Dubrovnik and received the OPP Gold Southern Europe Award 2011, together with his business partner Branimir Medic, and also in Montreal, Canada, they won the first prize, with their design for the Cultural Administrative Centre of Montreal. Puljiz can be described as a 'social architect', who is very much involved in a 'good feeling' and a healthy living environment of the inhabitants, like his colleague/partner Pi de Bruijn, who designed the extension of the Dutch Parliament and the urban plan for Amsterdam Zuidas, Financial Centre. But an architect is not the only factor in the process. Puljiz declares: "Architecture is not just making or designing buildings; it is a way of life. In a project as Vlashika, you need to be able to watch the whole project with a helicopter view and work together with all kinds of different experts, and at the same time you must watch the project on a smaller scale, and look for example from the perspective of the individual inhabitants. You must also keep a close watch on the details."